SCVHistory.com LW3212 | Film-Arts | Richard Dix Stars in 'The Arizonian,' Encounters Nudists at Vasquez Rocks, 1935. 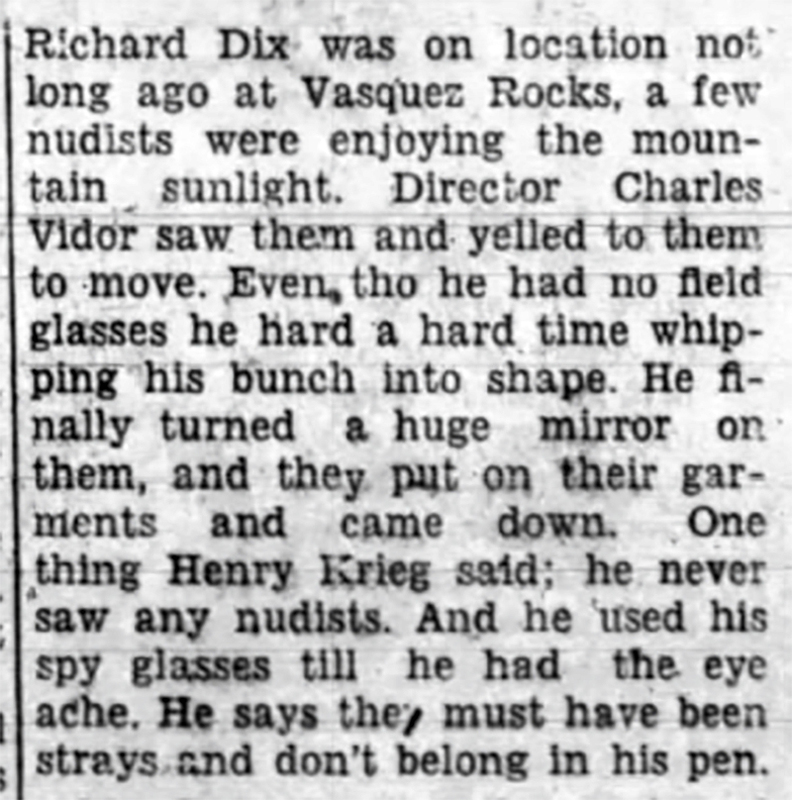 [While] Richard Dix was on location not long ago at Vasquez Rocks, a few nudists were enjoying the mountain sunlight. Director Charles Vidor saw them and yelled to them to move. Even tho he had no field glasses he hard a hard time whipping his bunch into shape. He finally turned a huge mirror on them, and they put on their garments and came down. One thing Henry Krieg said: he never saw any nudists. And he used his spy glasses till he had the eye ache. He says they must have been strays and don't belong in his pen. 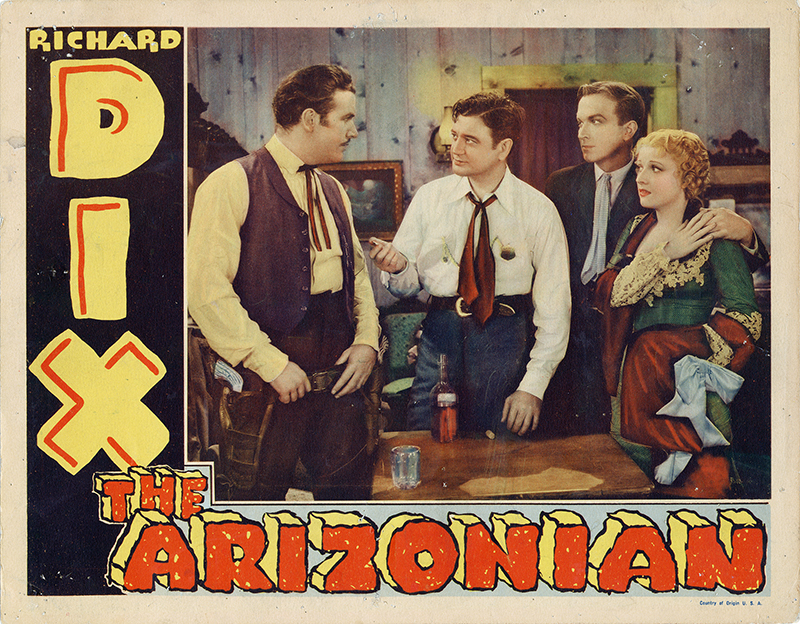 The movie was "The Arizonian" from RKO Radio Pictures. Principal shooting started in early April and ran through the middle of May. Besides Vasquez Rocks, locations included other parts of the Santa Clarita Valley (possibly Placerita Canyon), as well as the Iverson ranch in Chatsworth and the RKO ranch in Encino. All filming was completed by June 6, and the picture was released in theaters June 28, 1935. Western Epic with Historical Background Gives Dix Colorful and Popular Role. This is the story of Arizona in the early '80s when the frontier towns were ruled by outlaws under the protection of crooked politicians and officials. Richard Dix enters Silver City, and is soon enmeshed in the thick of the fight to bring law and order to the crime-ridden community. Dix finds a crooked sheriff with his kid brother and his sweetheart more or less in his toils, and has himself appointed marshal by the law-abiding citizens to clean up the town. Then the excitement starts in earnest, with Dix featured most of the time with Margot Grahame, the girl who scored so impressively in "The Informer." They make a grand team, and the thrills come as much on the quiet courage of the hero and his manner of handling situations as on his gun-play. But the gun gymnastics are in evidence, too, as well as some thrill scenes with Dix breaking out of a burning jail where the killers tried to murder him, facing the guns of four desperadoes, and in a fine assortment of fights and action stuff that will send all the fans out satisfied. Cast: Richard Dix, Margot Grahame, Preston Fester, Louise Calhern, James Bush, Ray Mayer, Willie Best, Joseph Sauers, Francis Ford. Producer, Cliff Reid. Director, Charles Vidor. Author, Dudley Niche. Screenplay, same. Editor, Jack Hively. Cameraman, Harold Wenstrom. Direction, Very Good. Photography, Excellent. HOLLYWOOD, May 27. — Routine heroics in every foot make this a superior western, fine for Saturday matinees or spotted on dual bills. A splendid cast gives unusual value to a film of good average caliber. 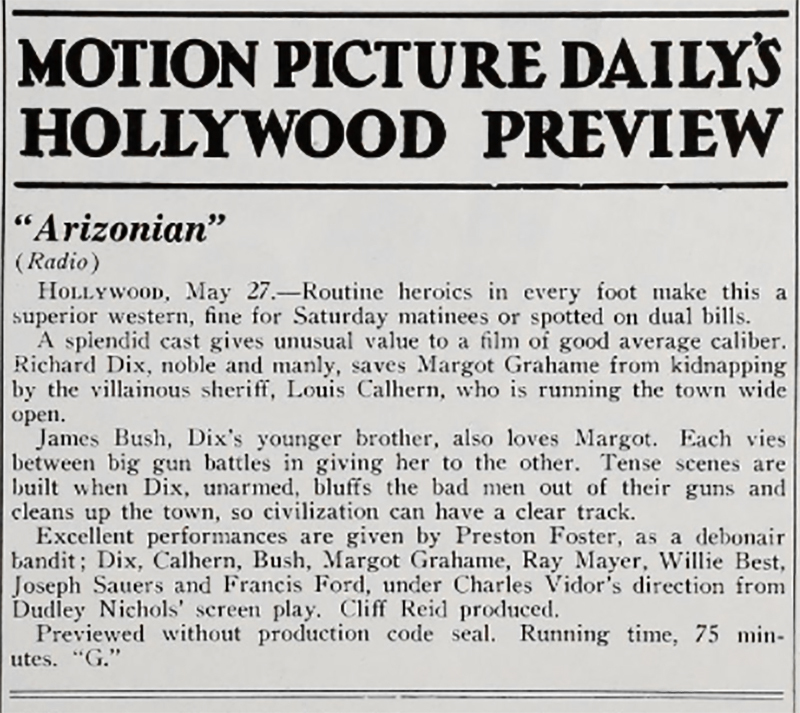 Richard Dix, noble and manly, saves Margot Grahame from kidnapping by the villainous sheriff, Louis Calhern, who is running the town wide open. James Rush, Dix's younger brother, also loves Margot. Each vies between big gun battles in giving her to the other. Tense scenes are built when Dix, unarmed, bluffs the bad men out of their guns and cleans up the town, so civilization can have a clear track. Excellent performances are given by Preston Foster, as a debonair bandit; Dix, Calhern, Rush, Margot Grahame, Ray Mayer, Willie Best, Joseph Sauers and Francis Ford, under Charles Vidor's direction from Dudley Nichols' screen play. Cliff Reid produced. Previewed without production code seal. Running time, 75 minutes. "G."
An out and out Western that has all the essentials of the old ones, yet is more concerned with conversation and character than riding, is this which brings forward Richard Dix in an excellent performance and has the novelty of an English actress as the heroine. She is Margot Grahame, who was fine as Victor McLaglen's wretched paramour in "The Informer." She is interesting here, poised, lovely and uncommonly intelligent. It is difficult, of course, to reconcile her personality with the part she plays. Nothing is said to account for her British speech nor her presence as an entertainer in a typical dance hall, nor even to explain her relationship to James Bush, her brother in the film. 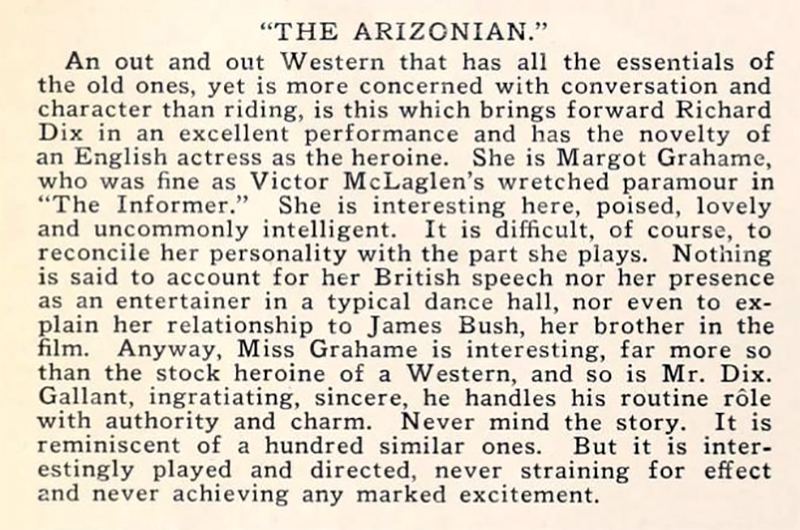 Anyway, Miss Grahame is interesting, far more so than the stock heroine of a Western, and so is Mr. Dix. Gallant, ingratiating, sincere, he handles his routine role with authority and charm. Never mind the story. It is reminiscent of a hundred similar ones. But it is interestingly played and directed, never straining for effect and never achieving any marked excitement. Except when they're interrupted by nudists. LW3212: 9600 dpi jpeg from original lobby card purchased 2018 by Leon Worden.